My article today is the ninth in a series of prompts that I hope might spark some creative expression in your kids, and maybe you too. Our first prompt was a general one, where we looked for something else to innovate on; our second took a poem as a model; the third used video as a prompt; the fourth started with something we liked; the fifth started with what if; the sixth looked to nature. In the seventh, we started with some story elements, and in the eighth we started with one word. I hope you and your kids will join me today so we can all challenge ourselves to be more creative. Today, my challenge is to start with geometric shapes. You could try going on a shape walk around your house, yard or neighbourhood, observing and recording shapes. You could piggyback on this idea and visit an art gallery or online source of art, looking for ways other artists have used shapes. You could challenge your child to a constructathon with shape blocks, taking turns to create people, animals and structures using geometric shapes. How many geometric shapes can we make with our fingers, or with our whole bodies? Can you make different shapes if you join up with a partner? Geometric shapes really lend themselves to some fun real life activities in 2D and 3D art, from tearing and gluing tissue paper shapes, to sculpting plaster you've poured into moulds. Kids could use flurrious.com to make a snowflake online from geometric shapes, make a tessellation online or try their hand at creating a mandala online. ABCya Paint is a nice online app where young kids can explore using shapes and adding other effects and stickers to their art. I decided to try to build a character from shapes, then make a story about him. 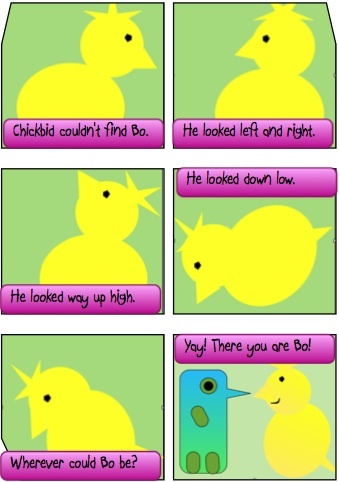 I made a very simple story about two shape creatures, Chickbid and Bo, finding each other. Once I'd built my Chickbid character from geometric shapes in Pages (Mac software), I moved shapes around to try for different poses, then took screen grabs of them. I found a template at Comic Life, popped the pictures in and added captions. This is definitely something you could try with quite young children. You don't need to try a digital version like I did. You could work in finger paint, dye or play dough. Kids might not be interested in creating a story, and that's fine too. What shapes will you start with, and where will they take you?